Regional Bike Route 50 heads up the east coast from Svendborg, hugging the water for part of the way, and sometimes zig-zagging inland to get around woods, campgrounds or big manor farms. The first part of the coast northeast of Svendborg is a place to enjoy the ocean views. Fields line the quiet coast road. Åbyskov, a hamlet of vacation homes lines the water later on. Later, there are a few remote beaches, great spots to stop and swim. After the road circles inland around a manor farm, Murhove, there are some great secluded beaches. Lambs and their mom under a tree full of ripe cherries: The cherries were great! 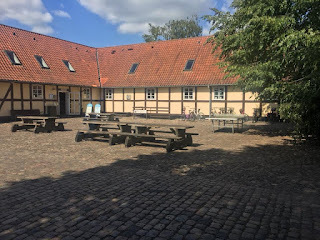 The first real town is Lundeborg, with its little harbor, where the local sailing school was making pancakes on their picnic tables when I came by. After that, Bike Route 50 heads inland again to go through hilly country and a few villages and small palaces, like Hesselagergard. Just before coming into the big port town of Nyborg, you go by the old moated palace of Holckenhavn. Turn in there to take a look at this old castle. It's now used as an event venue. So now just cross the causeway north into Nyborg and follow the signs to the town center. Like all the Danish towns we're visiting, Nyborg is scenic, full of pedestrian shopping streets in the old town. I really needed to sit down at a cafe and get a bite to eat and something to drink on my hot ride. 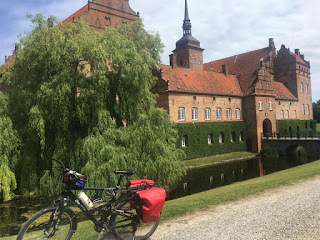 From Nyborg, we now turn west and follow National Bike Route 6 to the island capital of Odense. I was heading into the prevailing west wind, but it wasn't too bad. You first have to head through quite a bit of Nyborg before you get out onto a quiet road, and then you cross the Freeway a couple of times. But there is enough beautiful scenery along the way to make it enjoyable, like in the hamlet of Davinde. After you cross the freeway for the second time, you're in the outskirts of Odense, and there is a lot of traffic, but good dedicated bikeways. Odense, named after the Norse god Odin, has a lot to offer, with a lively downtown and lots of pedestrian streets, and it's the home of some good beers. It's most known for being the hometown of Hans Christian Andersen. A good place to spend the night! I had a great traditional Danish dinner and an Odense Classic beer at Restaurant Grønttorvet, sitting outside on the vegetable market square. I stayed the night in the youth hostel, located in an old manor-farm not far from the town center.